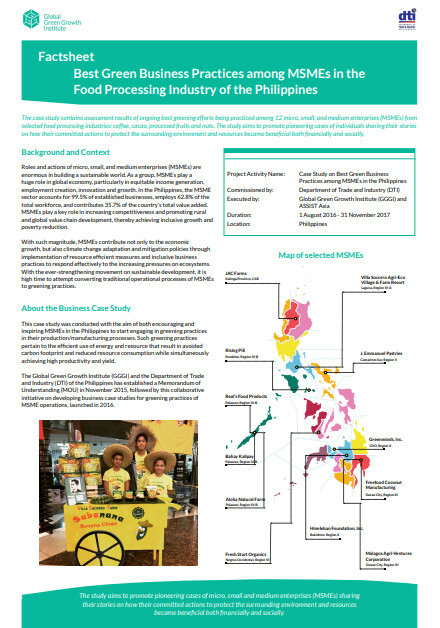 The case study, Best Green Business Practices among MSMEs in the Food Processing Industry of the Philippines, contains assessment results of ongoing best greening efforts being practiced among 12 micro, small, and medium enterprises (MSMEs) from selected food processing industries: coffee, cacao, processed fruits and nuts. The study aims to promote pioneering cases of individuals sharing their stories on how their committed actions to protect the surrounding environment and resources became beneficial both financially and socially. Roles and actions of micro, small, and medium enterprises (MSMEs) are enormous in building a sustainable world. As a group, MSMEs play a huge role in global economy, particularly in equitable income generation, employment creation, innovation and growth. In the Philippines, the MSME sector accounts for 99.5% of established businesses, employs 62.8% of the total workforce, and contributes 35.7% of the country’s total value added. MSMEs play a key role in increasing competitiveness and promoting rural and global value chain development, thereby achieving inclusive growth and poverty reduction. With such magnitude, MSMEs contribute not only to the economic growth, but also climate change adaptation and mitigation policies through implementation of resource efficient measures and inclusive business practices to respond effectively to the increasing pressures on ecosystems. With the ever-strengthening movement on sustainable development, it is high time to attempt converting traditional operational processes of MSMEs to greening practices. The Unique Quality Product Enterprise Empowering marginalised women in Ghana through reviving the cultivation of indigenous crops report showcases a business model is based on a market-leading approach to promote the productionand processing of the cereal grain fonio. The report Business and the Sustainable Development Goals: Best Practices to Seize Opportunities and Maxmise Credibility highlights the business advantage of ambitious strategies for contributing to the achievement of the Sustainable Development Goals (SDGs), examines common challenges and pitfalls that businesses face to delivering credible, meaningful contributions toward the SDGs, and offers a clear, actionable set of good practices for business leaders to inform their strategies moving forward.